ANDY LIEN, editorial director of Minneapolis-based LAVENDER, is stepping down after seven years at the publication. OUTSMART, based in Houston, was recognized by the Houston Press Club for last October’s “Heroes of Harvey” issue, capturing a second-place Lone Star Award for magazine layout. The issue focused on telling the stories of Hurricane Harvey’s LGBTQ heroes and survivors. The magazine also was second-place in the magazine article category for its July 2017 cover story about Harris County District Attorney KIM OGG as well as in the magazine column category for a piece by contributor KRISTOPHER SHARP about the deadly impacts of Texas’ anti-LGBTQ adoption and foster care laws. RAWSTORY MEDIA owners MICHAEL ROGERS and JOHN BYRNE recently acquired two new websites - ALTERNET.ORG, a pioneer in progressive online journalism, and THE NEW CIVIL RIGHTS MOVEMENT, a website focused on politics, civil liberties and the LGBTQ community. TARBOY PRODUCTIONS is a new Philadelphia-based production company made up entirely of LGBTQ people of color. Its first endeavor is an online show and YouTube channel called OUTPOUR, which features a mix of pop culture and social justice talk. LEAH WRIGHT is the new managing editor at FOCUS, based in Memphis, Tenn.
DAVID ZIMMERMAN, publisher of BOSTON SPIRIT magazine, has been named 2018 Person of the Year by NEW ENGLAND PRIDE TV. NLGJA convention heads to Palm Springs, Calif.
More than 350 LGBTQ journalists are expected to attend the 2018 convention of NLGJA - The Association of LGBTQ Journalists, when it gathers from September 6-9 in sunny Palm Springs, California. 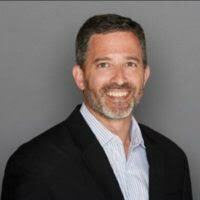 According to NLGJA Executive Director Adam K. Pawlus, the return to the West Coast is long overdue for the organization. Pawlus said the Palm Springs Mayor Robert Moon and the Palm Springs Gay Men's Chorus will be on hand to welcome convention attendees to the city. The gathering will feature over 30 topical and skill-building breakout sessions, ranging from “Telling the Bisexual Story” and "Trans 101” to "Hands-On Fact Checking” and “Increasing Your ‘It Factor.’" There will also be five plenaries, including two "View From the Top" sessions, which will bring together some of the top LGBTQ newsroom leaders from across the country and industry. Special guests will include Dennis and Judy Shepard, parents of murdered University of Wyoming student Matthew Shepard, to reflect on the changes in society and news coverage since Matthew was killed 20 years ago. “Judy Shepard was a featured speaker at the 1999 National Convention in Atlanta, and we're honored to have her back with us to commemorate the 20 year mark of Matthew's death,” Pawlus noted. He also noted that the LGBT Media Journalists Convening, sponsored by the Walter & Evelyn Haas, Jr. Foundation and the Arcus Foundation, will be running parallel to NLGJA’s convention in the Hotel Zoso this year. The Convening “uses an interactive approach to help attendees build their journalism skills, learn more about LGBTQ-centric topics beyond marriage equality and employment law and expand audiences through on-site media training with broadcast experts,” according to the website. In the past, the LGBT Media Journalists Convening has been held in or around March and not concurrent with NGLJA’s convention. Pawlus promises something for everyone. There will be a Diversity Reception, a Travel Writers Reception, a Lifetime Members Reception, a Women's Networking Dinner and a reception for convention attendees to get to meet the 10 students who will be participating in the CONNECT: Student Journalism Training Project, now in its 21st year. Pawlus said he hopes the convention will provide LGBTQ journalists a place to make lasting connections, discuss the state of the LGBTQ community in the news industry and evaluate ways to improve coverage of the LGBTQ community. A full agenda of speakers and sessions can be found at www.nlgja.org/2018. 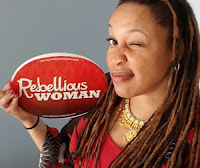 In advance of its upcoming national convention in Palm Springs, NLGJA - The Association of LGBTQ Journalists announced that Rebellious Magazine for Women founder and editor in chief Karen Hawkins is the inaugural recipient of the new NLGJA Jeanne Córdova Award. The award, according to the group, recognizes the achievement of an LGBTQ woman for a current body of work in journalism and/or opinion, with an emphasis on but not exclusively coverage of issues of importance to the LGBTQ community, in any medium and on any platform. Hawkins is the “Rebelle in Chief” of Rebellious Magazine for Women. She is an award-winning reporter and editor whose journalism background includes positions with the Associated Press, the Windy City Times, the Milwaukee Journal Sentinel and the Palm Beach Post. She is also the former director of communications for the Illinois Department of Children and Family Services. The award is named for Córdova, who was a journalist and the editor and publisher of Lesbian Tide, which chronicled the 1970s lesbian feminist movement. She authored both “When We Were Outlaws: a Memoir of Love and Revolution” and “Kicking the Habit: A Lesbian Nun Story.” She also organized a number of lesbian conferences and fought for lesbian and gay rights on a number of fronts. She founded the Community Yellow Pages, a directory of gay and lesbian-owned Southern California businesses, and co-founded an organization that sponsored lesbian art and history exhibits. She died in 2016. "Jeanne Córdova believed that good journalism was critical to supporting and transforming our movements,” said Lynn Harris Ballen, Córdova's spouse. “Her work as a reporter, a columnist and as publisher of the Lesbian Tide was always connected to her activism. She wrote that ‘being an organizer and journalist in the lesbian, gay, feminist, and women of color communities − and loving it − has been the focal point, of my life.’ In creating this NLGJA award for lesbian and queer women journalists, she wanted to reach out across generations for others to do the same because we are stronger when we support each other to keep telling the important stories for and by our communities." In its inaugural year, the award includes $2,000 to support the ongoing work of the recipient. The National LGBT Media Association (NGMA) announced its third annual Ad POP Award winners. The Ad POPs - which stands for Pride in Online and Print - honor the best representations of LGBT advertising in online and print campaigns in 2017, as placed in regional LGBT newspapers in NGMA member cities. The awards recognize clients, creative and placements agencies, and winners are selected based on their image and messaging. NGMA member papers each select one top award winner in their regional markets, plus a national award is handed out. This year, that award goes to Target Corporation. NGMA member newspapers include the Bay Area Reporter (San Francisco), Bay Windows (Boston), Between The Lines (Detroit), Dallas Voice, Gay City News (New York City), Los Angeles Blade, Philadelphia Gay News, South Florida Gay News (Wilton Manors), Georgia Voice (Atlanta), Washington Blade, Watermark (Tampa Bay, Fla.) and Windy City Times (Chicago). Local winners included the High Museum of Art, designed by Angela Jaeger, presented by Georgia Voice; Cambridge College, presented by Bay Windows; Orlando Health through Efficiency Media, presented by Watermark; the Illinois Office of Tourism, designed by J. Walter Thompson, presented by Windy City Times; Toyota, design by Imre, presented by Dallas Voice; Michigan State University Federal Credit Union, presented by Between The Lines; MedMen, presented by Los Angeles Blade; Borgata Casino and Spa, designed by SKG Global, presented by Gay City News; The Philly POPS, presented by Philadelphia Gay News; City Ventures, presented by Bay Area Reporter; Island City Stage, presented by South Florida Gay News; Straz Center for the Performing Arts, presented by Watermark; Rufskin, designed by Hubert Pouches and Douglas Coats, presented by the Washington Blade. San Francisco’s Bay Area Reporter commemorated a historical milestone this month. 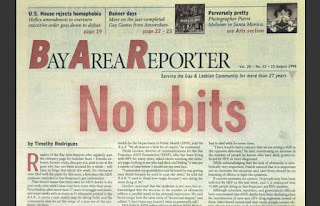 On August 13, its famous “No obits” article turned 20 years old. The original article was published because, for the first time since the start of the AIDS epidemic, no obituaries were submitted to the newspaper that week in 1998. Timothy Rodrigues, who was assistant editor at the time and wrote the original article, came back this month to write the newspaper’s guest opinion column, reflecting on what writing that article meant to him, and how it offered a little hope back with new protease inhibitor drugs were becoming more widely available. 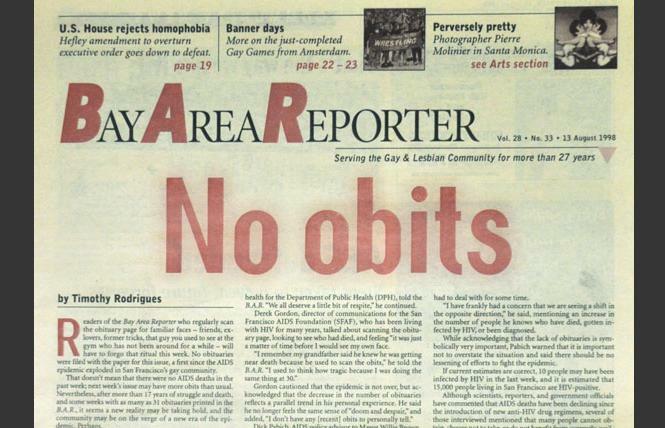 The 1998 article emphasized that while no obituaries were submitted that week, it did not mean there were no AIDS-related deaths. And Rodrigues spoke with several people living with HIV/AIDS as well as activists who cautioned that the epidemic was not over. Rodrigues said he was assigned the 1998 story, in part, because he had recently been diagnosed with HIV. Michael Yamashita, publisher and owner of BAR, said that his paper receives inquiries about the “No obits” article from time to time, and the paper is regularly asked for the cover image from that issue.